What are the advantages of horizontal front points on crampons? There are two (main) types of front points with crampons (that I am aware of): Vertical and horizontal ones. Usually vertical is used for technical mountaineering, ice and mixed climbing and horizontal for "non-technical" mountaineering (glacier to moderate mixed). I can't think of any functional advantage of horizontal front points over vertical ones. By functional I mean that I am not interested in marketing, so cheaper or designed for that particular purpose are not what I am after (there are light all purpose mountaineering crampons with vertical front points). What is the reason horizontal front points are widely used? Think of a shovel, you use the sharp edge to cut into the snow, and the flat blade to pack it down. 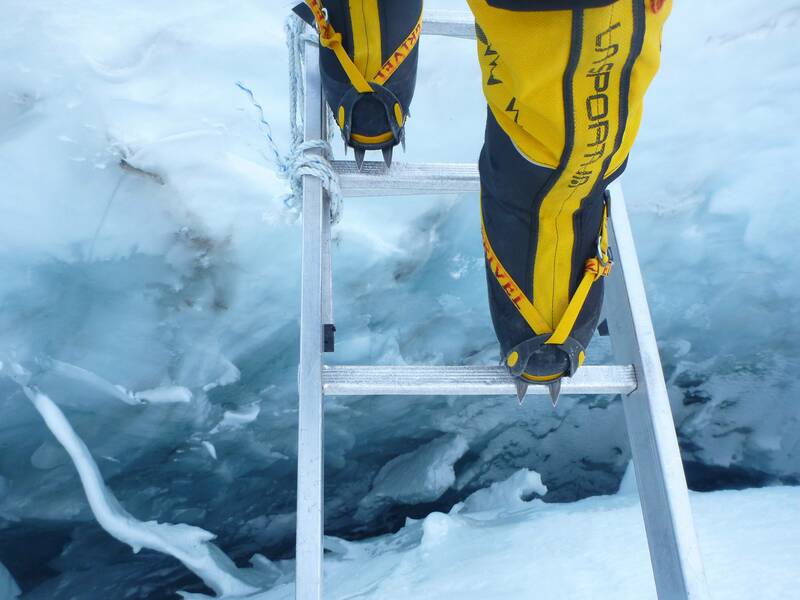 When you're climbing soft ice, you don't want to cut through it, you want it to support your foot so you can you stand on it. I personally have a pair of both, but I've hiked on spring snow and ice with people who were wearing vertical front points, and have watched their feet rip through the ice in spots where my foot placements didn't move in my horizontal front point crampons. I've seen the same thing with people climbing wet waterfall ice even, especially if they only have one front point, they stick it into wet soft ice and it just shred right through it. I caught a fall because of this 2 weekends ago actually. Not the answer you're looking for? Browse other questions tagged mountaineering crampons or ask your own question. Do alpine boots hurt when walking (not climbing)? What crampon front-point setup options are specific for various types of ice climbing? Can I get crampons for small feet? What are the use cases for ski crampons over boot crampons? What should you do if your crampons start balling up?